Last week, the Golden State was the focal point of much of the blogosphere’s interest. Three separate stories about some form of wrongdoing or impropriety in that state were among the most popular. Two involved actions by California politicians, while one featured a modern method of mourning that appeared morally questionable to some bloggers. 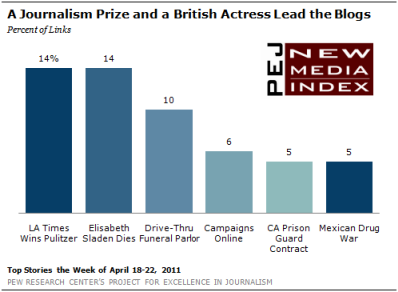 For the week of April 18-22, 14% of the news links on blogs were about the awarding of a Pulitzer Prize to the Los Angeles Times for its coverage of corrupt officials in Bell, California, tying it for the No. 1 subject ranking, according to the New Media Index from the Pew Research Center’s Project for Excellence in Journalism. The prize-winning series, which appeared in the spring of 2010, exposed the exorbitant salaries of city officials in the small, working class town. As a result of the investigation, eight former city officials were charged with multiple felonies and many California counties instituted tough new disclosure laws. Last week, the Pulitzer Prize committee awarded the Times a gold medal for public service, which triggered a conversation about the improper activities of public officials. In addition, many bloggers saw the award as a sign that quality newspaper journalism is not dead, as social media users discussed one of traditional journalism’s most prestigious awards. And in another sign of the interactivity that social media can facilitate, several individuals at the Los Angeles Times shared information on how the series was created and the joyous reaction of those in the newsroom when they learned of the Pulitzer award. Another California story making the list of top five subjects among bloggers (at 5%) was an agreement between Governor Jerry Brown and the state’s prison guards. The new contract allows guards to save unlimited vacation days which could result in massive payoffs for officers when they retire. Most bloggers felt that Brown was giving special deals to a group that had been one of his biggest political backers. The No. 3 biggest story last week, at 10%, was another California issue that angered bloggers, although it had nothing to do with politics or public policy. Instead, it was a drive-thru funeral home in Compton, California where mourners can pull up to the facility and pay respects to the deceased through a glass-encased chamber. A number of commenters found the idea tasteless and a poor way to honor the dead. The other story that tied for first on blogs last week (at 14%) highlights two patterns found in social media: the influence of British news and culture and the marking of deaths of famous individuals. The passing of actress Elisabeth Sladen, 63, was especially noteworthy for British children because of Sladen’s role in The Sarah Jane Adventures, a British science fiction series which was a spin-off of the show Doctor Who. Many blogs linked to a BBC page that featured children’s memories of Sladen. 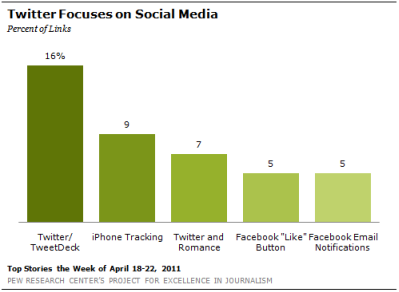 The role of social media in presidential campaigns was the fourth subject, at 6%. The story reported on how, in the wake of Barack Obama’s successful embrace of social media in 2008, all candidates are now looking online to aid their campaigns. And another subject that tied for fifth last week (at 5%) was a Los Angeles Times story about Mexican drug cartels setting up shop in cities around the U.S. such as Seattle, Anchorage and Minneapolis. On Twitter, the top stories had to do with both the pros and cons of new technologies and social media. The leading subject, with 16% of the news links, involved rumors that Twitter was in the process of acquiring TweetDeck, a site that is a personal browser where users can design and focus on the tweets and updates they are most interested in. (No sale has taken place at this point.) Some linked to a Mashable story explaining how the move was a defensive business maneuver by Twitter. Others highlighted a TechCrunch story concluding that Twitter was defending its turf, but also predicting that the move would wind up being the end of TweetDeck. The controversy over the discovery by Wired that iPhones and iPads have tracking devices that have been sending users’ location information to Apple for the past 10 months was No. 2 on Twitter, at 9%. Overwhelmingly, Twitterers were disturbed by the news and worried about a possible invasion of privacy. The issue has stirred enough controversy that Senator Al Franken (D-MN) announced he would be holding a Congressional hearing on mobile privacy in May. A study by the dating site OKCupid showing that active users of Twitter tend to have shorter relationships than the rest of the population was third biggest story (at 7%). That was followed by two different stories about Facebook, both at 5%. One was the marking of the one-year anniversary of the creation of Facebook’s “Like” button, a function that has been duplicated on thousands of other sites across the web. The other was news that Facebook had accidentally turned on the email notification function for some users, sparking a wave of complaints. The corruption of government officials in Bell, California, exposed by Los Angeles Times reporters was brought back into focus last week when the paper won a Pulitzer Prize. A few bloggers used the opportunity to criticize an improper use of public funds. Most bloggers addressing the subject, however, used the story to discuss the role of the media. And some Times staffers, including some of those who worked on the project, shared their first-hand observations of the reporting process. After Gov. Brown approved a 200-page contract with the state’s prison guards, one clause stood out in terms of generating reporting and commentary. Guards will now be allowed to save unlimited amounts of vacation, which could result in large payments when they retire. Critics claimed this would be a huge liability for taxpayers. Brown defended the agreement, however, by claiming that the furloughs imposed by Gov. Schwarzenegger added so many days to corrections officers’ time off that they could not help but exceed the vacation caps. Brown drew the ire of the blogosphere when the Los Angeles Times also reported that the California Correctional Peace Officers Association spent nearly $2 million to help his campaign last year. “California unions spent tens of millions to put retread Governor Jerry Brown back into office. So, it is not all that surprising that he is, once again, doing California’s taxpayers no favors by letting the unions ride roughshod over him in recent budget negotiations,” argued USA In the News. “Governor ‘Moonbeam’ pays off a voting block,” declared Yossarian at DailyBrisk. Although the Los Angeles Times story on the drive-thru funeral home in Compton described some of its benefits-such as the convenience for mourners and the ability for many people to see well-known community members-most of the bloggers saw it as objectionable. “To me it screams undignified and tacky but clearly the market exists and kudos for the funeral home for offering the service to those in their time of need,” added Five Forces. “What have we come to that we can’t stop and park our car to go in and pay our respects to the dead?” wondered Tales of a Misplaced Southern Boy. The most-viewed news video on YouTube last week was an embarrassing moment for a world leader. The video shows Czech Republic president Vaclav Klaus pocketing a pen during an April 10press conference in Chile alongside his Chilean counterpart Sebastián Piñera. The Czech leader is seen taking the pen out of the box and inspecting it before the pen vanishes under the table and into his pocket. The viewers are guided through the complete operation with the help of red circles and arrows.